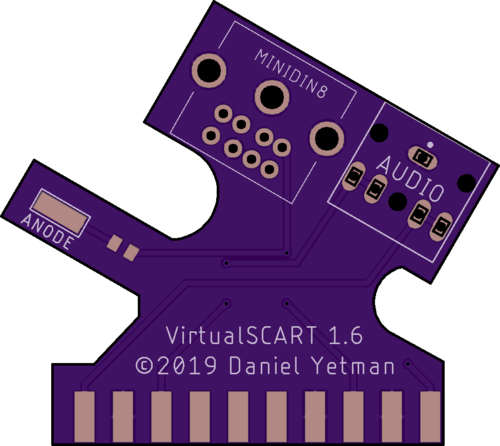 With Furrtek's VirtualTap in the wild now, it is up to end users to acquire or make their own SCART cables for RGB out (or rather, RRR), which is not exactly the easiest thing to do. A nearly-perfect option is Tim Worthington's 2600RGB/NESRGB video cable. I actually had an extra one laying around for when I finally decided to finish my 2600RGB install, so I decided to use it for my VB. One small problem - it doesn't quite work. Upon investigation, the Fast Switching(Blanking) signal is not connected. Now, it's possible for someone to jump the connection themselves without too much difficulty. However, whatever is worth doing, is worth OVERDOING! Thus, I present to you the VirtualSCART PCB! This is a perfect drop-in replacement for Tim's connector and will connect all signals required. I intend for this to complement both my VirtualCable and my VirtualTap breakout board.